I love Fall. Love the weather and love all the beautiful colors. 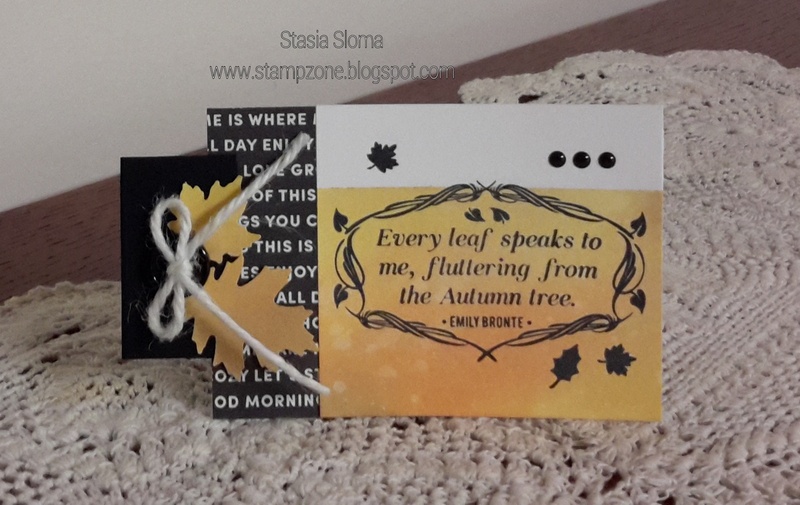 The Autumn's Calling stamp from The Project Bin has the perfect sentiment. Every leaf speaks to me, fluttering from the Autumn tree. I decided to make a tag or in my case it will be used as a bookmarker. The background is combination of Fossilized Amber and Spiced Maralade Distress Oxide inks. Sprinkle a little water and beautiful background. I took my Martha Stewart and Fiskars leaf punches and punched out some leaves with the Distress Oxide background. The designer series paper is from American Crafts Fall Day. Enamel Dots, Buttons and Twine finish the tag off.